For various reasons this week I haven’t had to cook many meals. So it made me feel more able to try something new. I’ve been meaning to cook some more Lorraine Pascale recipes from her first book “Baking Made Easy”. I decided to make Chicken Pastilla – a Moroccan chicken pie. 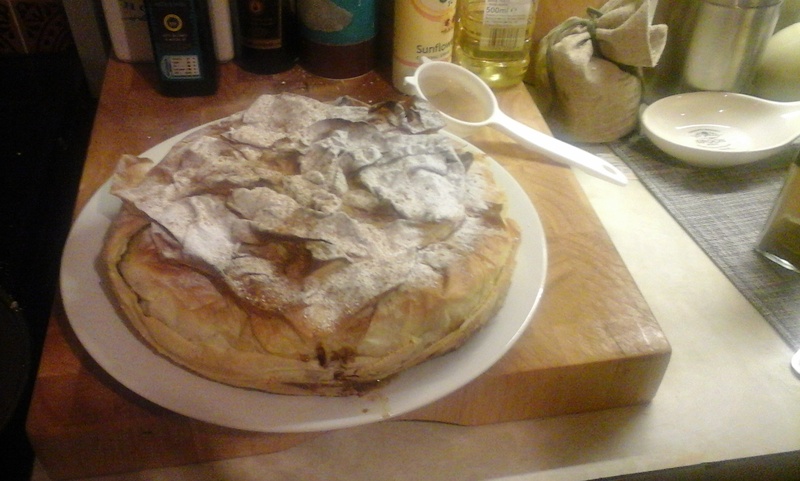 I recently discovered that most shop-bought pastry is dairy free, so this filo pastry pie is perfect on our dairy free diet. 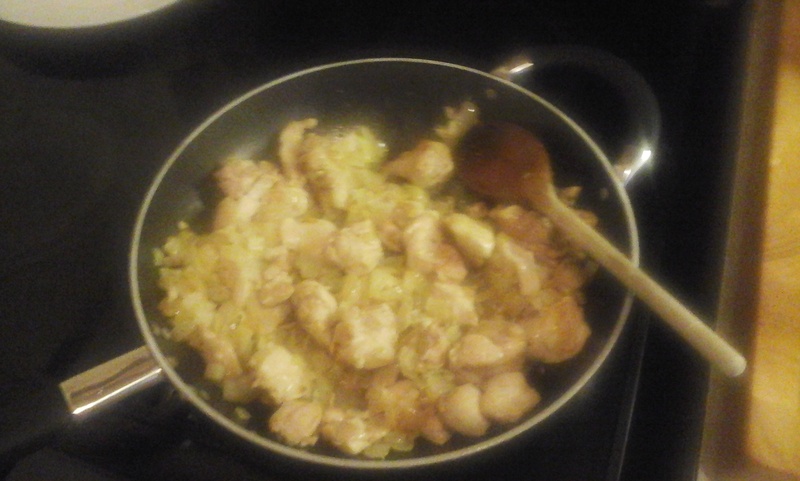 Start by browning onion, garlic, and diced chicken thigh. 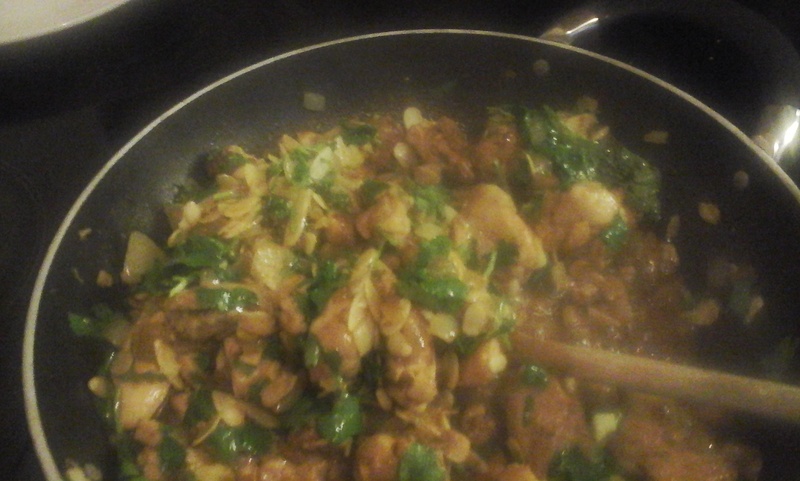 Add some spices (ginger, cinnamon, coriander), honey, flaked almonds and coriander. 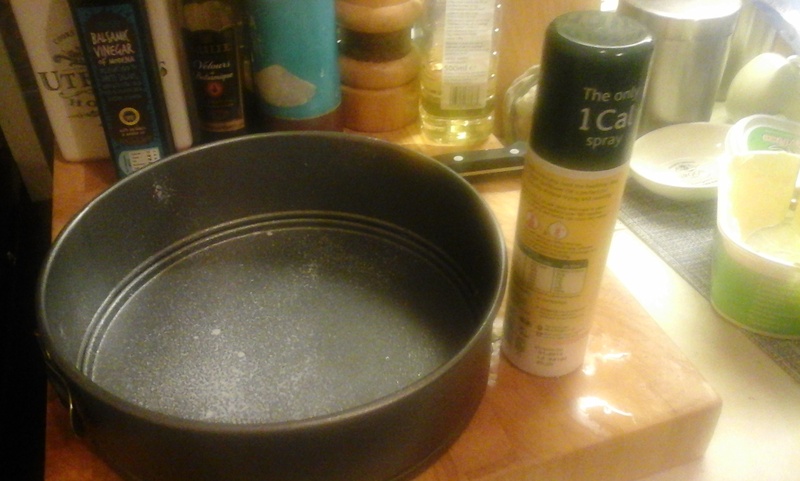 Oil a large springform baking tin. I always use spray oil. 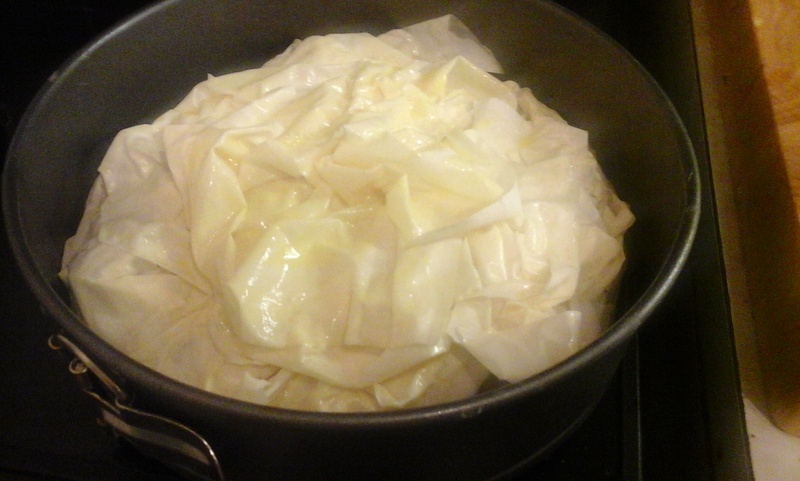 Then brush sheets of filo pastry with melted butter (I used dairy free spread, but butter would be so much better! 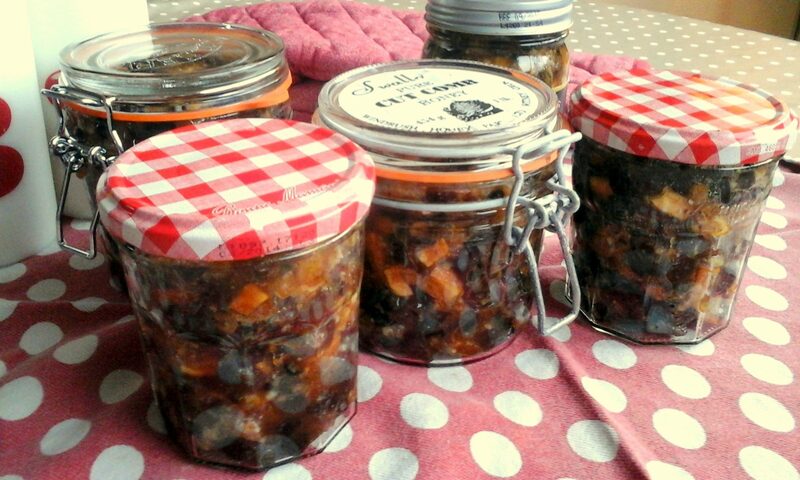 ), and lay them overlapping into the tin – about 5 sheets. 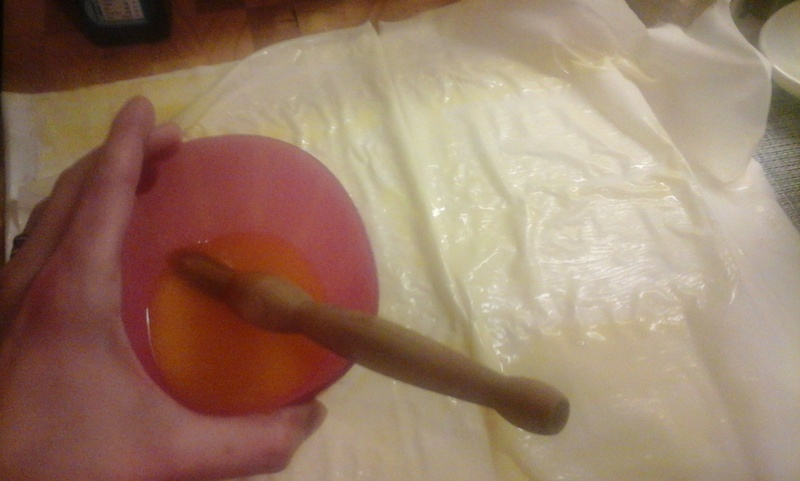 While you’re working, keep other sheets of filo covered up with a damp tea towel, otherwise they become really brittle. 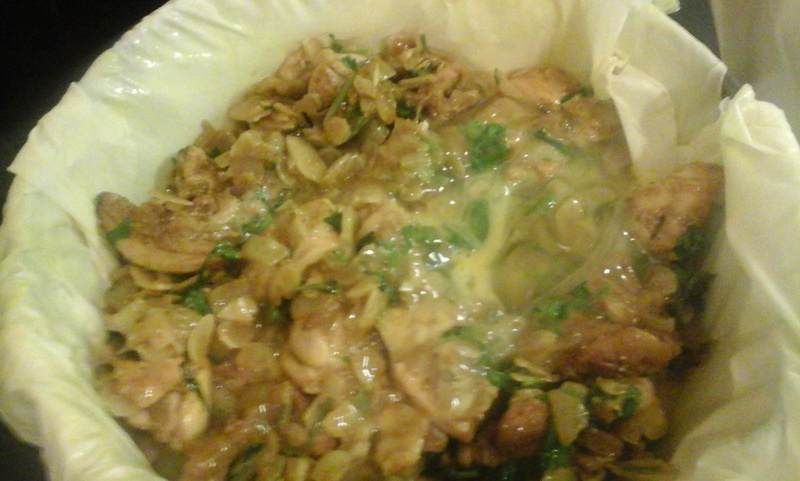 Then pour the chicken mixture in. And pour 3 beaten eggs on top. 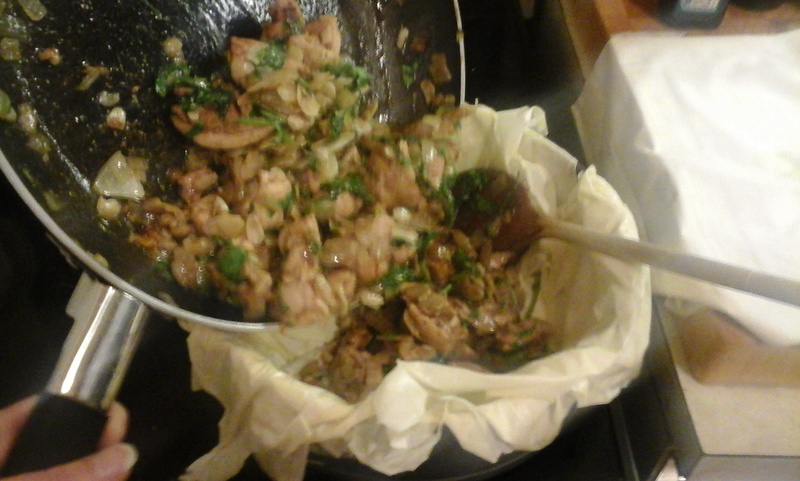 Fold the overhanging pastry back on top of the chicken mixture, and scrunch up a few more buttered sheets of filo on top. 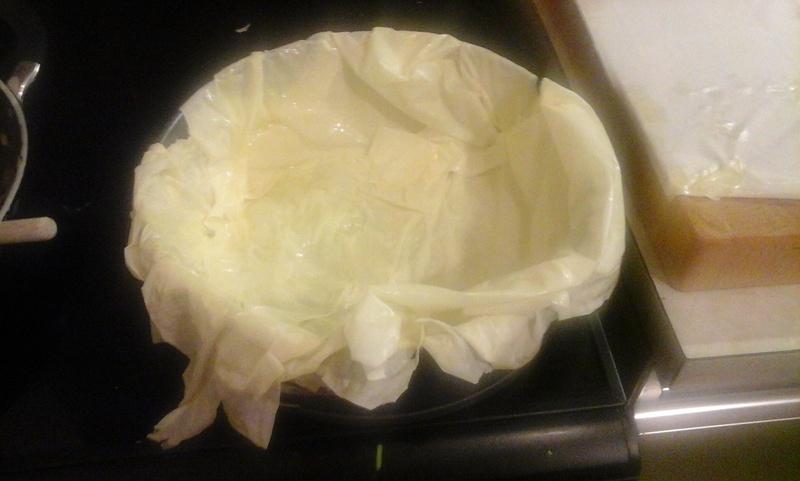 (Any leftover pastry from the packet can be tightly wrapped in clingfilm and frozen). 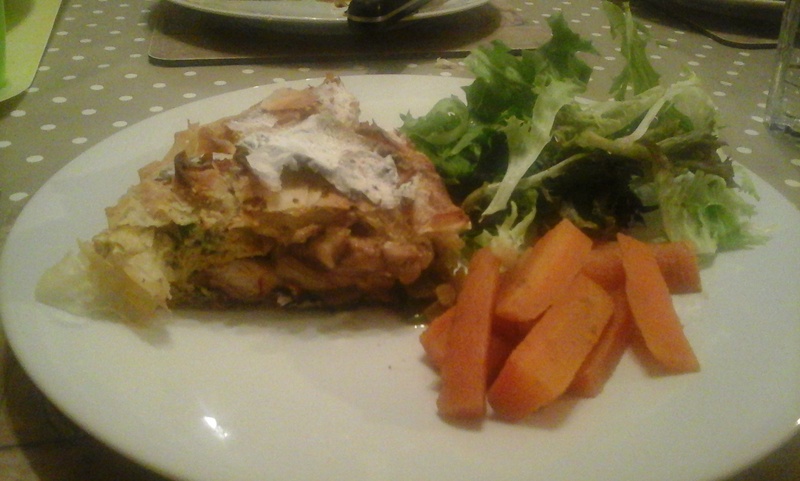 It’s a sort of whole meal in a pie, so I just served it with salad and carrots. 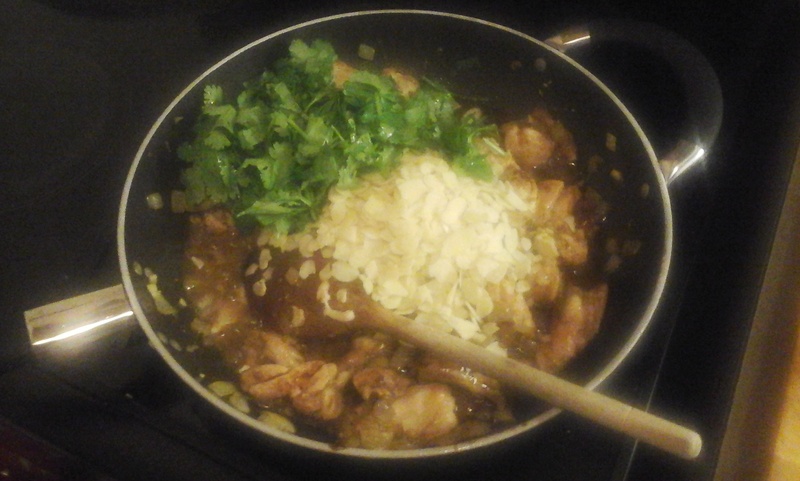 The chicken mixture is like a sweet flavoursome (but not hot) curry, so the cinnamon and sugar goes really well actually. Next time I would cook it just a touch longer. Unfortunately, the recipe in the book is not massively helpful or well proof-read. If I had followed the recipe properly, I would have removed the onions from the pan at one point, and never put them back in! The recipe gave no oven temperature. And the serving suggestion was quite amusing: “Serve on a rug, with buttered carrots” – now that sounds messy! Think the recipe is actually Moroccan, not Mexican. Nice post! Thanks! I’ve updated it now. 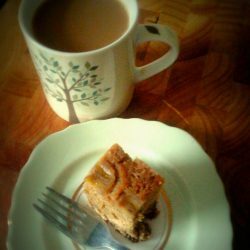 I think the word “pastilla” confused me – sounds sort of Spanish!